The Intel P Series including the P4500 Series, P4510 Series, P4501 Series and P4600 Series of PCIe / NVMe SSDs have been designed for cloud storage solutions and has been built with a new Intel Developed NVMe controller, optimised for read intensive workloads and industry leading 3D NAND. To minimise service disruptions and help Data Centres protect their investments, the P series has been designed to maximise performance, capacity, manageability, and reliability. Enterprise PCIe*/NVMe*-based SSDs for cloud storage solutions. 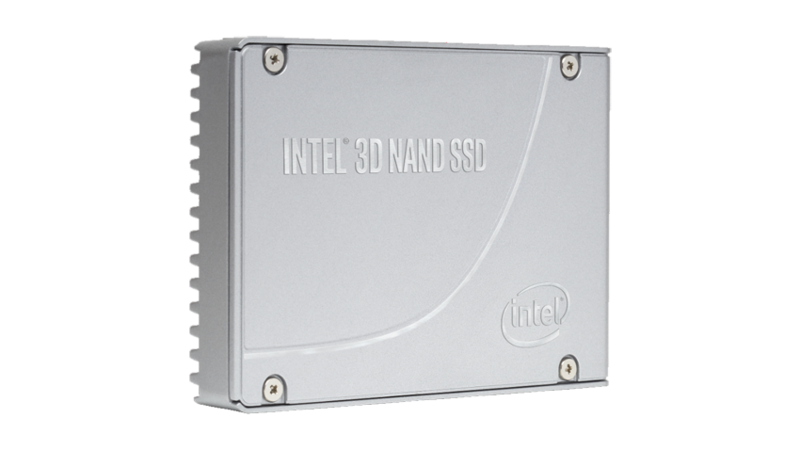 Packed with a deep feature set, this cloud-inspired Intel® 3D NAND SSD is optimised for cloud infrastructures, offering outstanding quality, reliability, advanced manageability and serviceability to minimise service disruptions. Optimised for Cloud Storage Efficiency the P4500 Series is optimised for read intensive workloads, maximising CPU utilisation with reduced TCO. Built with advanced manageability features such as NVMe-MI, the Intel SSD DC P4500 Series allows you to remotely monitor, manage and remediate across more device states and streamline essential services. Designed for today’s modern data centres. 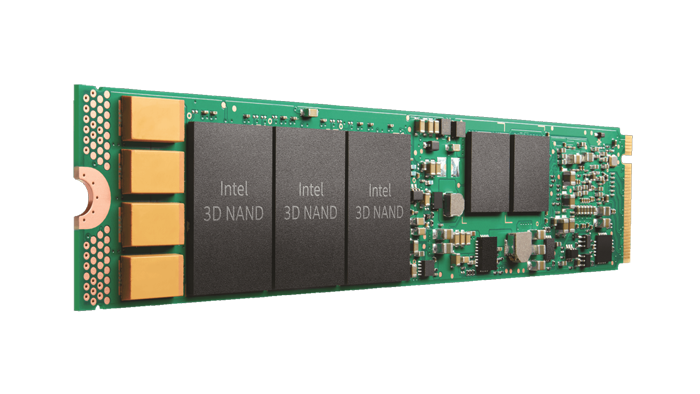 Pairing a new Intel developed controller, unique firmware innovations, and industry-leading 3D NAND density, the Intel® SSD DC P4500 Series—a member of the Intel® 3D NAND SSD family—delivers an all new design to support cloud storage and software-defined infrastructures. The Intel® SSD DC P4500 Series is stacked with a blend of performance, capacity, manageability, and reliability to help data centers fast-track their business and meet the overall demands of their digital business. To meet data center’s exacting needs for growing capacity, easy serviceability, and thermal efficiency, the DC P4500 is now available in the revolutionary “ruler” form factor. End-to-end data protection, protection from silent data corruption, uncorrectable bit error rate < 1 sector per 1017 bits read. Designed for power conscious and space constrained cloud storage solutions. The cloud continues to drive innovation, new services, and agility for businesses, which need to deploy services faster, scale effectively, and reduce the human costs of managing assets. Software-defined and converged infrastructures are central to cloud solutions that help businesses meet these goals. In addition, today’s data centers face space and power constraints. To meet these challenges, Intel offers space and power optimized SSD options in a variety of form actors to give solution designers choices to reduce Opex, increase agility, and reduce Capex. DC P4501 drives are built to maximise IT efficiency within existing server footprints. 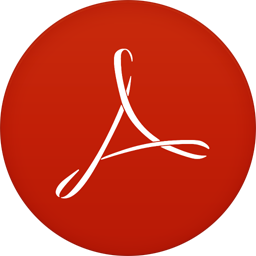 New firmware manageability features—including improved firmware updates, health monitoring, and secure erase—help reduce server downtime through improved update processes and expanded monitoring capabilities. In addition, the Intel® SSD DC P4501 is platform-compatible with Intel® Volume Management Device (Intel® VMD) which delivers seamless management of PCIe-based NVMe* SSDs and enables enhanced serviceability and hot-plug to minimise service interruptions during drive swaps. SMART management and Intel custom log pages provide advanced drive telemetry to manage thermals, monitor endurance, and track drive health status. Management coverage is now expanded across a wider range of drive states with support for the NVM Express* Management Interface (NVMe-MI) specification, an industry standard way to manage the SSD out-of-band. As capacity per server continues to scale, the risk of data corruption and errors increases. With an eye toward this risk, Intel has built industry-leading end-to-end data protection into the DC P4501. This includes protection from silent data corruption, which can cause catastrophic downtime and errors in major businesses. Power Loss Imminent (PLI) provides protection from unplanned power loss, and is obtained through a propriety combination of power management chips, capacitors, firmware algorithms, and a built-in PLI self-test. Intel’s PLI feature provides data centres with high confidence of preventing data loss during unplanned power interrupts. Built with the same cloud inspired design as the Intel® SSD DC P4500 Series, the low power Intel® SSD DC P4501 Series enables energy and space efficient storage solutions to help data centres do more per server, minimise service disruptions and efficiently manage at scale. Designed to meet today’s increasingly demanding service levels and support broader cloud workloads, while reducing storage costs. Built from the success of its cloud-inspired predecessor – the Intel® SSD DC P4500 Series – and architected with 64-layer, TLC, Intel® 3D NAND Technology, the Intel® SSD DC P4510 Series delivers performance, Quality of Service (QoS), and capacity improvements to further optimize storage efficiency, enabling data centers to do more per server, minimize service disruptions, and efficiently manage at scale. Built on NVMe* specification 1.2, these PCIe* SSDs are available in 1TB, 2TB, 4TB, and 8TB in the U.2 2.5” (15mm) form factor. Multi-cloud has become a core element for any enterprise strategy, and top cloud providers have responded by openly embracing PCIe/NVMe-based SSDs with scalable performance, low latency, and continued innovation. As software-defined and converged infrastructures are swiftly adopted, the need increases to maximize efficiency, revitalize existing hardware, deploy new workloads, and yet reduce operational expenditures. The Intel® SSD DC P4510 Series meets these requirements. It significantly increases server agility and utilization, and accelerates applications across a wide range of cloud workloads. Intel’s 64-layer, TLC, 3D NAND technology enables the DC P4510 to double the capacity available compared to its immediate predecessor, the Intel® SSD DC P4500 Series. This increased density is the key to supporting broader workloads, allowing cloud service providers to increase users and improve data service levels. Better QoS is ensured with an intelligent firmware algorithm that keeps host and background data read/write at an optimum balance. With the DC P4510, host applications will not only have access to double the capacity, but will also be serviced at up to 80% faster write rate,1 2 up to 2x better random write IOPS/TB,3 2 and up to 10x reduction of service time (compared to the DC P4500) at a QoS metric of 99.99% availability for random access workload. With this level of workload ability and agility, data centers can refresh existing hardware and reduce operational expenditures. To ensure telemetry information without disrupting ongoing I/Os, the DC P4510 includes enhanced SMART monitoring of drive health and status, using an in-band mechanism and out-of-band access. A power loss imminent (PLI) protection scheme with a built-in self-test guards against data loss if system power is suddenly cut. Coupled with our industry-leading end-to-end data path protection scheme,5 PLI features enable ease of deployment into resilient data centers where data corruption from system-level glitches is not tolerated. The DC P4510 combines firmware enhancements with new 3D NAND features to prioritize host workload and ensure better service levels. The result: 6x workload support at a given service level response time. To help data centres make the most of increased SSD capacity per server, dynamic namespace management delivers the flexibility to enable more users and scale deployment. The DC P4510 also provides security features like TCG Opal* 2.0 and built-in AES-XTS 256-bit encryption engine, required by some secure platforms. With the capability to manage multiple firmware versions on a drive and to support updates without a reset, the DC P4510 improves integration and increases the ease and efficiency of deploying at scale. With the increased density of Intel 64-layer 3D NAND and enhanced firmware features, the DC P4510 is built to handle read-intensive workloads and beyond. The DC P4510 creates greater Quality of Service, bandwidth, and performance to lead data centers through their evolving transformation. Designed for modern cloud storage solutions such as software-defined and converged infrastructures. 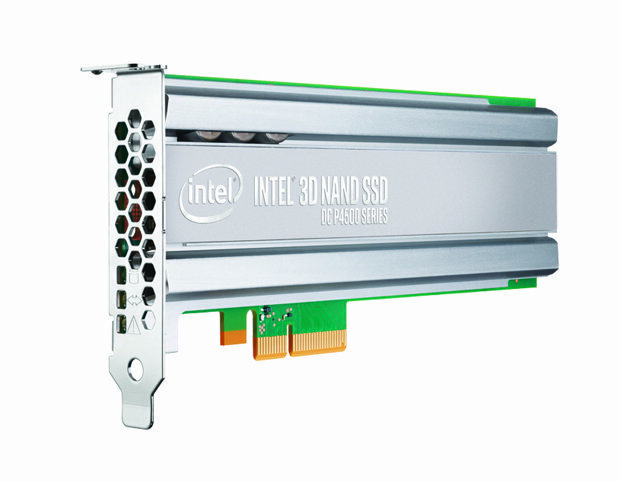 Pairing a new Intel developed controller, unique firmware innovations, and industry-leading 3D NAND density, the Intel® 3D NAND SSD Data Center P4600 Series delivers an all new design to support the data caching needs of cloud storage and software-defined infrastructures. The Intel SSD DC P4600 Series is stacked with a combination of performance, capacity, manageability, and reliability to help data centers fast-track their business and meet the overall demands of their digital business. The cloud continues to drive innovation, new services, and agility for businesses, which are seeing the need to deploy services faster, scale effectively, and remove the human costs of managing assets. Multi-cloud has become a core element for any enterprise strategy, with top cloud providers openly embracing PCIe*/NVMe*-based SSDs because of the scalable performance, low latency, and continued innovation. Within the shift to the cloud is an increased adoption of software-defined and converged infrastructures. This fast adoption is being driven by the need to increase efficiency, refresh existing hardware, deploy new workloads, and reduce operational expenditures. The DC P4600 significantly increases server agility and utilisation, while also accelerating applications, across a wide range of cloud workloads. This cloud-inspired SSD is built with an entirely new NVMe controller that is optimised for mixed workloads commonly found in data caching and is architected to maximize CPU utilisation. With controller support for up to 128 queues, the DC P4600 helps minimise the risk of idle CPU cores and performs most effectively on Intel platforms with Intel® Xeon® processors. The queue pair-to-CPU core mapping supports high drive count and also supports multiple SSDs scaling on Intel platforms. With the DC P4600, data centers can accelerate caching to enable more users, add more services, and perform more workloads per server. Now you can cache faster and respond faster. The DC P4600 is built for software-defined cloud infra-structures across the multi-cloud environment to enable greater efficiency within existing server footprints. New firmware manageability features help reduce server downtime through improved update processes and expanded monitoring capabilities. SMART management and Intel custom log pages provide advanced drive telemetry to manage thermals, monitor endurance, and track drive health status. Management coverage is now expanded across a wider range of drive states with support for the NVMe-Management Interface (NVMe-MI) specification, an industry standard way to manage the SSD out-of-band. As capacity per server continues to scale, the risk of data corruption and errors increases. With an eye toward this risk, Intel has built industry-leading end-to-end data protection into the DC P4600.1 This includes protection from silent data corruption, which can cause catastrophic downtime and errors in major businesses. Power Loss Imminent (PLI) provides protection from unplanned power loss, and is obtained through a propriety combination of power management chips, capacitors, firmware algorithms, and a built-in PLI self-test. Intel’s PLI feature provides data centers with high confidence of preventing data loss during unplanned power interrupts. 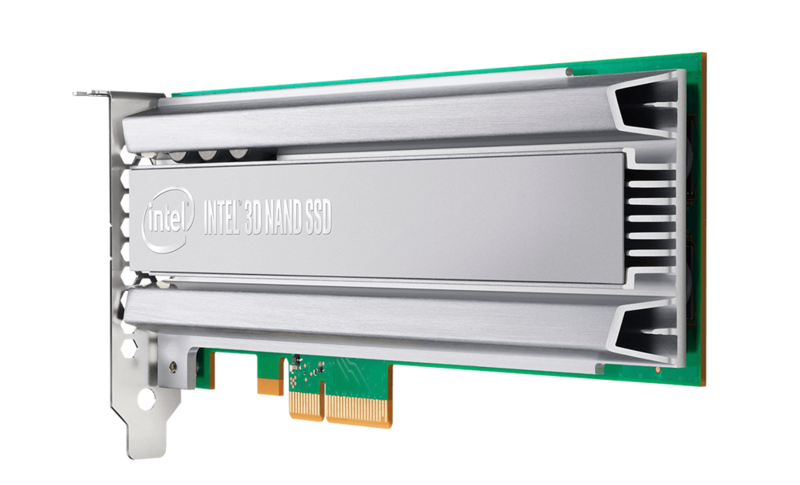 The DC P4600 is Intel’s new 3D NAND SSD for mixed workloads that are common to the data caching needs of cloud-driven data centers. The mix of performance, capacity, endurance, manageability, and reliability make it the ideal solution for data caching in software-defined and converged infrastructures.